There are two types of clue. That is always challenging to the numpties and we are initially solving almost cold, though that symmetry at least tells us how long the partner clues at the other end or other side of the grid are. We labour on without even a taste of the usual Listener compiler’s alcoholic tipple, though Rood has allowed us a couple of litres of milk (‘A cuppa swamped by two litres of milk’ LL around TEA with the extra C being produced by the wordplay) an ‘Old pickled African man’ who ‘appears before court’ (OU before CT giving SOUCT and producing an extra S) and a sulphurous out-of-fashion brewing ingredient (Out-of-fashion brewing ingredient expels sulphur on addition’ (YEST in an obsolete form, losing S = YET). We work on, admiring these extremely well-constructed and deceptive clues. It isn’t just the way the entire clue is built round the deceptive hints provided by those thirty misprints (take, for example ‘Shop for merchandise in Croatia once – group of stars acquiring foremost in stylish yachts’. Here is an image of the Cannes jet set buying top class merchandise in cheaper places in the Med, but oh no, that clever word play ARGO + S(tylish) Y(achts) is disguising an old trading ship the old nave Ragusa or ARGOSY. 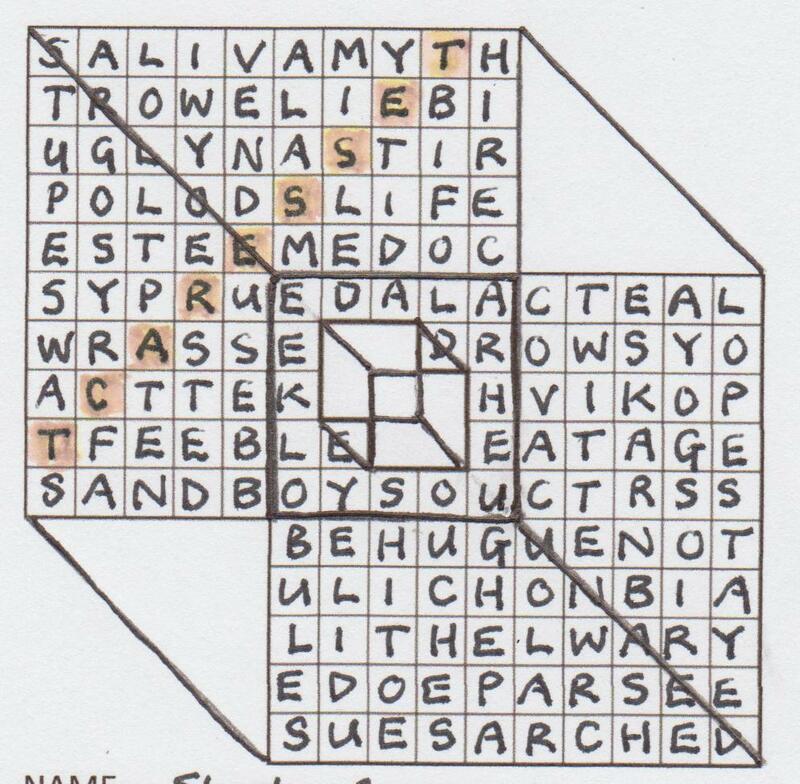 Just imagine the complexity of cluing this crossword knowing that thirty clues have to have the first and eight letters fixed in advance by a pre-decided message! Of course, the message might have been adjusted depending on the availability of letters. I hope Rood will tell us in a setter’s blog. We have enough of those letters to discover that we have to LINK POINTS WHERE THE SAME LETTERS MEET NW TO SE AND JOIN UP EIGHT CORNERS. Be honest, numpty! You struggled long enough not only to sort out the message, especially the NW and SE bit, and then just as long to understand what it meant. 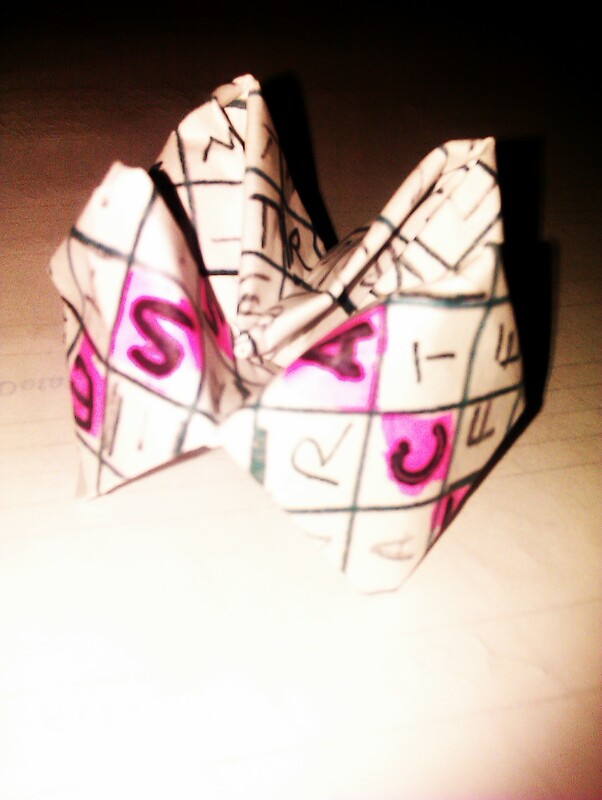 I have a delightful little photo of what one frustrated solver communicated to me as his last desperate attempt to unravel the final instruction – a construction that origami experts would be proud of. He had studiously joined up the eight corners. I have visions of Mr Green laboriously unfolding such constructions, like Jago’s little origami birds a couple of years ago. Fortunately we experienced the next penny drop moment. There were just four sets of NW to SE letters in the grid CC UU BB and EE and they had been ingeniously placed at the four points where this see-through CUBE’s front wall intersected with its back wall. Now, by drawing those lines, as we had been instructed to do, linking the eight corners, we had constructed a three-dimensional cube. But what about that white shape in the centre? There were eighteen more letters that had appeared out of that ‘extra letter in the wordplay device’ COPY SHAPE CENTRALLY. That last step was fun and how I marvelled at the shape that appeared. There was one little cube inside the other. Isn’t that a TESSERACT, I ask the other numpty, but, of course, I didn’t really need to as the word was spelled out for me. This entry was posted on 30 November 2012 at 5:00 pm	and is filed under Solving Blogs. 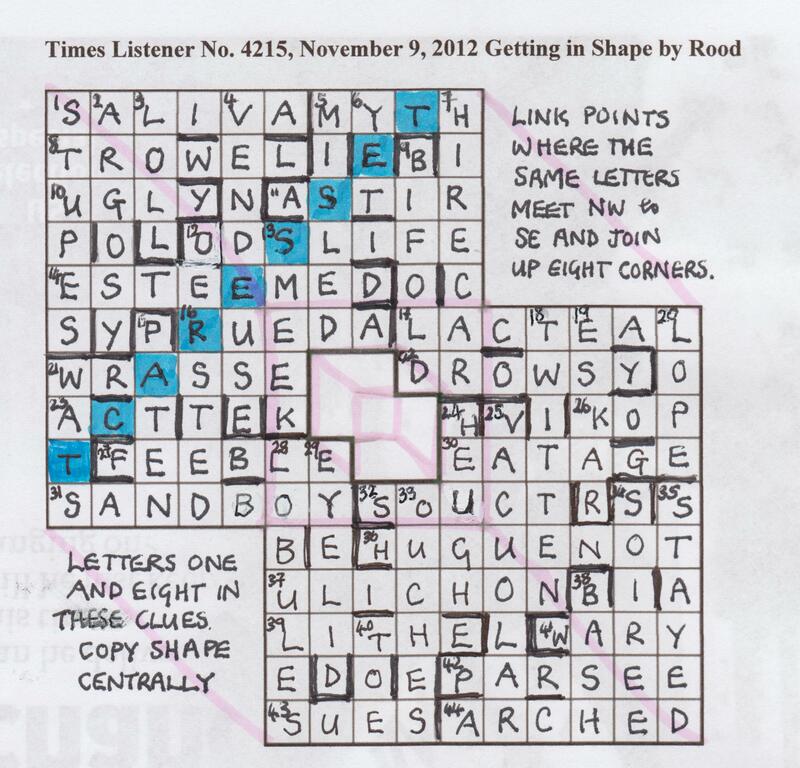 Tagged: crossword tesseract, Getting in Shape, Rood. You can follow any responses to this entry through the RSS 2.0 feed. You can leave a response, or trackback from your own site.